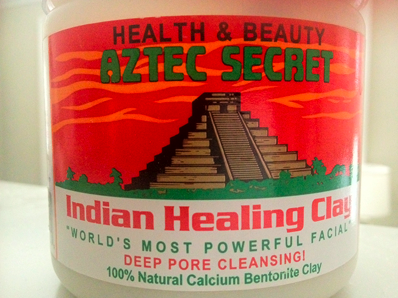 Aztec Healing Clay | Ooh, my favorite! My skin hasn’t been much happy since my epic cold last week. I figured I’d give it a few days to get back on track but it became clear this morning that I needed to help it along since ultimately my body is still working to expel many of the toxins and ickiness from my cold. I notice even the whites of my eyes are still a bit red, which is also an indication that things are still working to heal. At least where my skin is concerned I decided that I’d help it along with my favorite Aztec Indian Healing Clay mask, a natural remedy of 100% Bentonite Clay and over 50 different minerals from Death Valley, California. The mask mixture consists of about a tablespoon of Aztec Healing Clay powder and few teaspoons of raw organic apple cider vinegar. 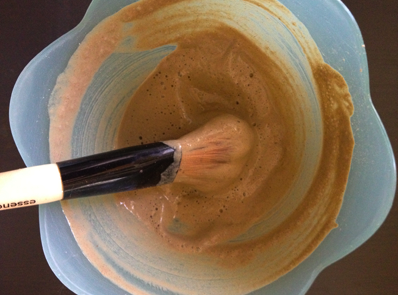 I’ve repurposed a make-up foundation brush to mix and apply the clay. It makes it so easy and fun! When you add the cider vinegar it will foam a bit, so use a non reactive bowl and brush/mixer. 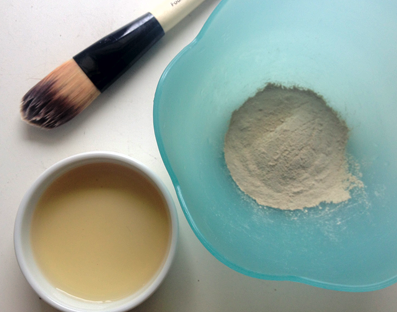 Adjust the consistency of the clay to make it easy to apply; not so thick that it takes forever to dry, and not so watery that it doesn’t extract anything from your pores. If you’re worried about using the vinegar you can substitute filtered water, but for me I much prefer the vinegar. The goal is to absorb as much from the pores of your skin as possible, while still using only clean and natural ingredients. Once you’ve got the right consistency start painting! 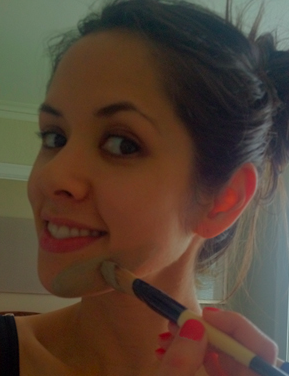 If you have make-up on you’ll want to wash your face first. Be sure to get the creases on the side of your nose, the underside of your chin, and even your neck. This part feels REALLY good, so I usually take some time going over everything a few times. Once you’re done it will take about 20 minutes to dry. While I wait I usually boil a pot of nettle tea and let it steep for 10 minutes. I pour a small amount aside and let it cool while I sip another cup. This is a spa-ish experience after all; but really, the nettle tea works wonders internally and will soon help post-mask also. While you’re drinking your tea you’ll notice that you can feel your face pulsating from the clay. It’s a good thing, enjoy it! Once the clay is dry it will be a chalky whitish color, very different from the army greenish color it was when it was wet. Hop in the shower (you can just use the sink but it can get a little messy…especially if you did your neck.) Use warm water and gently wash away the clay. When you’re done your face will be RED, but don’t be alarmed. This is normal and it will go away in about 20-30 minutes. This is where the cooled organic nettle tea comes in. 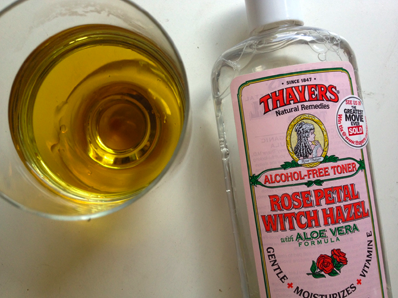 I use this to splash on my face to cool and soothe some of the redness, but also to act as a toner. My skin loves it! I’ll let it dry and repeat another three or four times, then follow it with a splash of Witch Hazel. Follow this with your favorite moisturizer, but after all this work you’ll want to make sure it’s free of any synthetics, fragrances, parabens, etc. Here I will usually take a very small amount of my trusty organic coconut oil and lightly massage it into my face. If your face is very dry you’ll want to do something a bit heavier. There’s really nothing cleaner you can do for your skin. Try a regular routine of at least once a month, but be sure to give this regimen time to bring any impurities to the surface and rid of them before you discontinue it. Also be sure not to underestimate the importance of your diet in the case that your skin is giving you problems. For example, I noticed that when my diet is high in wheat and dairy (or after a horrible cold) my skin just isn’t the same. I’m so glad you’re going to try it, Perry. It really is a cost-effective way to take care of your skin, and SO healthy too. Let me know what you think! !